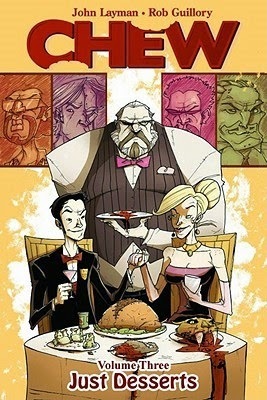 I read Taster's Choice, the first volume in John Layman's Chew, and though I thought the book was intriguing, I also found it outright disgusting. Thanks to some encouragement from Andi of Estella's Revenge, I thought I would stick with the series a bit longer. Tony Chu returns to the FDA with his unique talents as a cibopath (someone who can track the paths of whatever he eats, both the good and the bad). He has a new, yet familiar partner to assist him on his tasks, yet ends up going it alone on a personal mission to a small island called Yamapalu. His special talents combined with his training as a cop and FDA agent are the only things that might save his from this little adventure. In the third volume, Tony Chu has a LOT going on -- a crazy partner, a mission that reveals a lot more hidden secrets, the return of Savoy, and maybe even a little love. The thing I like more about this particular volume is that there is more focus on the characters and less on the disgust (yes, it does still exist). The best part was the bombshell at the end. That alone kept me reading to find out more. 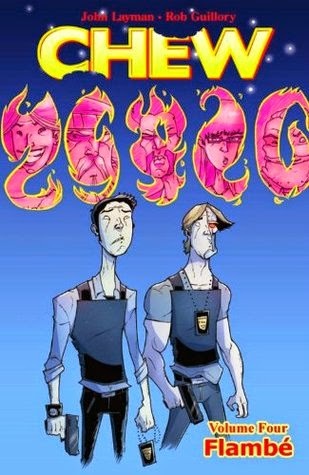 In Flambe', an otherworldly event preoccupies the minds of everyone around Agent Chu, which leads to some interesting adventures in his department. This new little twist combined with the one from the third volume has me more interested in this series than ever before. The disgusting parts remain, but they are fewer and I have gotten past the shock factor the first volume presented. I will likely continue to read this series for now. 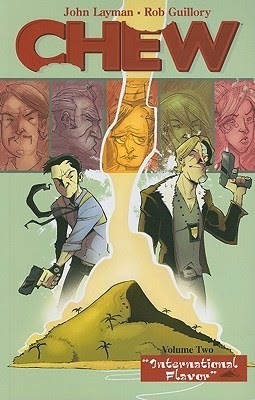 For Chew fans ... Do you believe the series improves as the reader progresses? Can I expect the improvement to continue? FICTION STATE OF MIND ... What about Volume 2 derailed you?!? I give you gals credit. Life is too short---especially as you get older, like me! lol, and my TBR list is way too long, filled with books I know will be amazing---to spend time reading a series that's disappointed in a big way or truly disgusted me. I totally would've dropped it! writersideup.com ... I had heard that this one got better, so I decided to give it a try! I have this weird habit of needing to finish things that I start, whether I like them or not! I've been working on this, but not being very successful at it. I have slowed on this series. I really liked volumes 1-3 but they didn't bowl me over like Sweet Tooth. I'll likely continue with Sweet Tooth (since I have to buy my graphic novels), and let Chew go for a bit. Andi ... I'm out for a bit too actually! We move next week, so I'm not checking any more books out from the library. Once I get to my new city, I will have to see if I can borrow more from the library or revert to buying my own as well.